The perfect gift, click here! Buying a made-to-measure shirt with Shirtonomy is simple. Let us guide you through our three step process and we promise that you will be rewarded with a personal shirt experience that cannot be matched when buying normal off the shelf shirts. The first step is to explore our fabric gallery (click on SHIRTS in the main menu to get started). You can filter the fabric galleries options based on your preferences regarding color, patterns, or weave. Click on the respective shirts to see more information about the fabrics properties and to get inspirations on how the fabric can be composed. Put your own stamp on your made-to-measure shirt by choosing the collar, cuff and other design options. Alongside every design option is a icon which can be clicked for extra information, pictures and inspiration. Are you still unsure about what to choose? We have made it simple for you by always offering a default design combination that works with the fabric you have chosen. The first time you buy a made-to-measure shirt with Shirtonomy let our measurement guide take you through each step toward your perfectly sized shirt. You start with the dimensions of your favorite shirt and make any adjustments needed to acheive the perfect fit. The only tool you require is a measuring tape. Your measurements are then saved under your private profile making your next visit with Shirtonomy even smoother. Shirtonomy was born from frustration over the lack of a quality alternative in the shirt market for those who did not conform to standard sizing while searching for high quality at an affordable price. Our journey began in 2012 when we travelled across Europe meeting numerous manufacturers. Many believed our quality demands to be too high and compared working with us to a walk in the desert. Other believe that we do not charge our customers enough and have therefore chosen to work with us anonymously. Shirtonomy offers made-to-measure shirts crafted to your own unique wishes - both in fit and style. 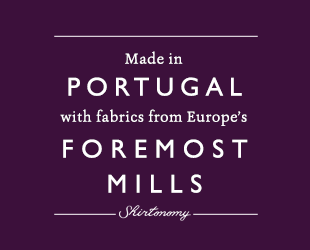 Our made-to-measure shirts are sewn in Portugal, at one of Europes foremost shirt manufacturers, while our fabrics are produced primarily in Italy and England by some of the world's most renowned weavers. 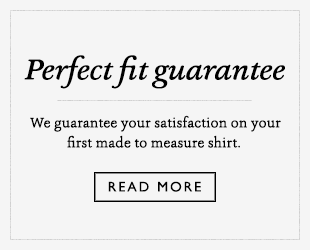 So that our customers feel 100% comfortable that their shirt's fit will be perfect we offer the Shirtonomy Perfect Fit Guarantee. If you are not completely satisfied we will correct the shirt for you free of charge regardless of the problem. If the shirt cannot be adequately corrected we will arrange a new one be made for you. As a customer of Shirtonomy you can always be sure that the fit will always be perfect - from the very first made-to-measure shirt! Did you know that you, as a customer, have access to Give & Get?